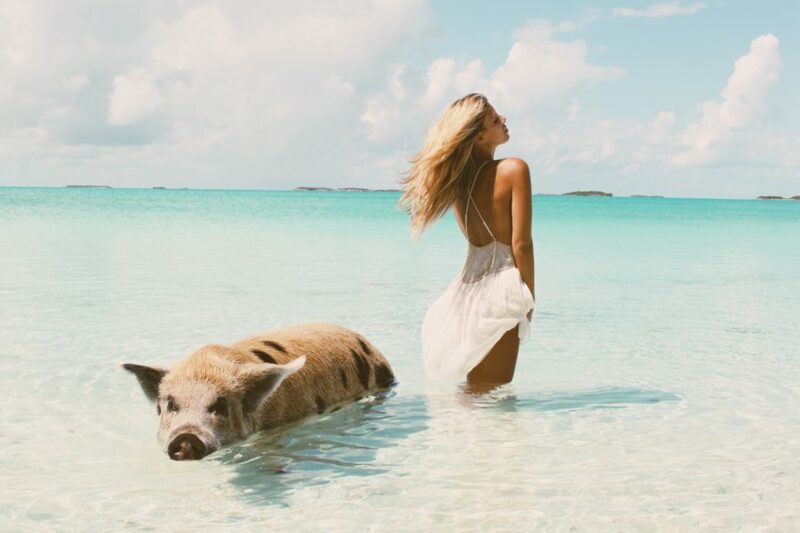 A fairly whimsical visit to “Pig Island” in The Bahamas. Love, love, love these shots! That dress though?? Who is the designer and where can I get it??? Such beautiful shots! The pig is the perfect accessory for a little comic relief and difference. You’re always so stunning! WOW!!! These photos! This dress and you are gorgeous. And I’m impressed you’re so comfortable with this big pig. I’m not sure I would of been. What a gorgeous post!! Incredible!!! Love these…. absolutely incredible shots and you look stunning as usual! Beautiful! I love the dress and that pig! I really love the juxtaposition between the pig and your dress. By the way, the photography on this blog is stunning! Okay, this has to be THE most unique fashion blog post I’ve seen! Love the slight bit of humor and fun. Sometimes fashion blogs can be so serious! WOW!!!! What an amazing shot! Makes me wanna go to The Bahamas again! Very inspiring pics! You look amazing, love the dress. I just found your blog and i think that this is gorgeous. Pictures are good quality and outfits inspiring! Thanks for inspiring me! Fantastic! My husband’s and my dream one day swimming with those pigs in the bahamas!